Acer has launched the £279.99 Acer C20 PICO Projector, stating that the pocket sized gadget will allow you to comfortably enjoy your videos, photos or presentation with your friends anywhere. Available in 'Candy Pink, Metallic Blue and Silver' – and you know which one we think will sell best – is billed as smartphone size and can project on surfaces from 5 inches right up to 66 inches. "The C20 PICO projector is just about the size of a smartphone and weighs a handful of grams, yet delivers impressive performance, freeing you from the small screen and giving a whole new meaning to travelling light," explains Acer. "Furthermore, with the internal speaker you don't even need to carry around a separate amplifier if you fancy watching a video," the press release continues. 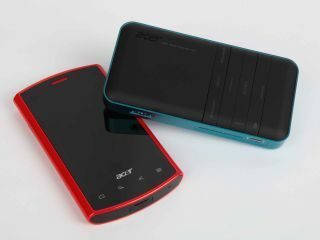 The Acer C20 offers integrated SDHC card reader, native 16:9 format picture, WVGA resolution and 2000:1 contrast ratio. It also allows you to show presentations and videos directly from a USB flash drive, and the LED lamp, combined with DLP technology, offers 'up to' 20,000 hours.